There have only been a few times in my life where I have ordered hot chocolate at a restaurant, and after only one sip, knew that it was special. That it was more than a couple scoops of canned cocoa mix added to milk. Or worse, added to water. The horror! And over the years I’ve tried to recreate that rare and luscious hot chocolate drink at home. But I’ve struggled to concoct one that is velvety smooth and creamy, with just the right amount of chocolate, and not overly sweet. 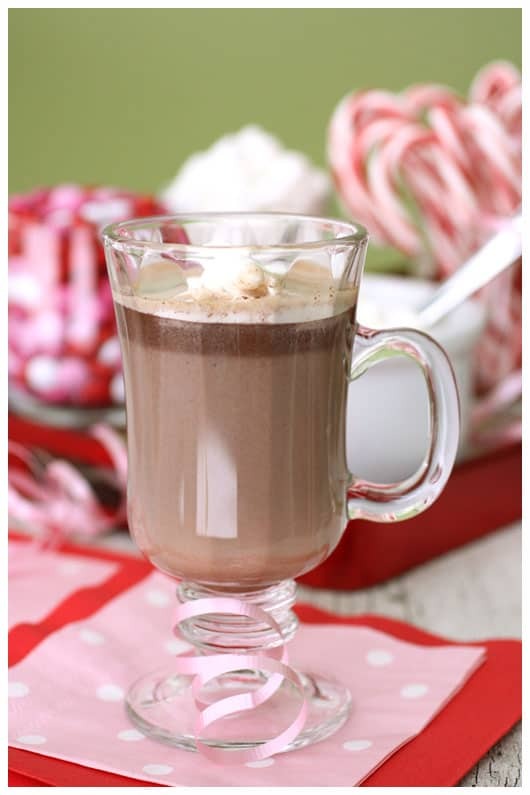 One that I would forever call my go-to hot chocolate recipe. Well, I struggle no more. Thanks to my friend, Annmarie, I now have at my fingertips the absolute best hot chocolate recipe I’ve ever made. It’s everything I have craved, and more. I was surprised at the amount (lack!) of chocolate in the recipe, and was tempted to double the quantity the first time I made it. But I stayed true to the 2/3 cup of chocolate chips. And I’ve never made it any other way since. It has wonderful chocolate flavor. And the secret to the creaminess? 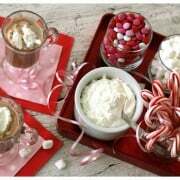 There is whipped cream stirred right into the hot chocolate mixture. And if you know me at all, you know how much I like my fresh whipped cream. Just a little somethin’ I picked up from Dad, who has been known to correct a person calling Cool Whip “whipped cream”. 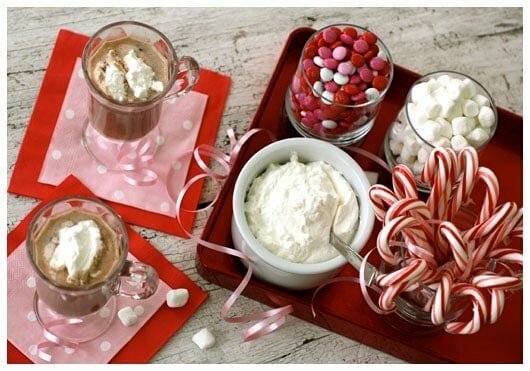 Have you ever held a Hot Chocolate Party?! Since I’ve had this recipe, for the past two winters now, our oldest daughter has invited over a few girlfriends for some play time and hot chocolate. And we serve it up with all the fixin’s. The girls love it. Especially when I walk out of the room, leaving them with a whole can of Reddi-Wip! I like to host these parties during the Christmas season, or around Valentine’s Day, when there’s extra incentive for winter festivity. But this kind of gathering could warm up any cold and dreary day. Guaranteed! Yield: about 4, depending on how big your mugs are! First, start heating your water, to get it to a boil. In a separate pan, scald* your milk. While the water and milk are heating up, melt the chocolate chips in another medium pan over low heat, stirring constantly. Once melted, stir in sugar and salt. Slowly add the boiling water, mixing well. Add the scalded milk. Simmer for 2 minutes, or until the sugar dissolves. Blend in vanilla and whipped cream, stirring to combine. Do NOT boil. Stir periodically as it sits. *Scalded milk is simply milk heated to 180°F. I truthfully don’t ever use a thermometer to measure the temperature. I just warm up the milk until it’s heated throughout and steamy. Be careful to not let it boil. Rachel at A Southern Fairytale for “Mouthwatering Mondays”. Please check it out right here! Robyn at Add a Pinch for “Mingle Monday”, right here!